I just wanted to say hello to everyone here. I've been along time lurker, and enjoy picking up tips from these forums. Unfortunately winter is drawing to a close, but I want to highlight some of our gear in the next little while to show what we offer for the winter trekker. I plan on extending an exclusive offer for Winter Trekking forum members as soon as I figure out what that might be, but in the meantime, HELLOOOOO! All prices include shipping CONUS. Tents and Shelters / Winter hammock hangers? Any other winter hammock hangers here or am I the only crazy one? 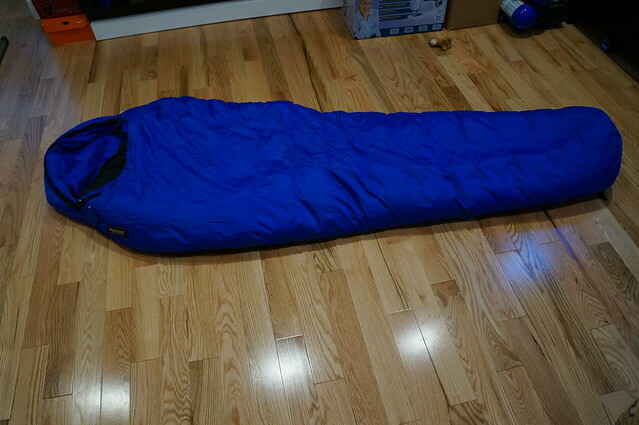 I have for sale a NEW Mountain Hardwear Lamina -30 degree synthetic sleeping bag.I bought it last winter and never got my hot tent finished. I sold the tent over the summer and now I want to sell the bag to pay some bills.The bag is new, never used or compressed (except for the picture I took today). It is a LONG and will fit up to 6'6". The weight on my scale is 5lb 4.5 oz, and the compression stuff sack weighs 4.5 oz. It has 9" of loft and is rated for -30°. If you are using a pulk sled and camp/hunt in extreme conditions this might be your bag. I went synthetic b/c I expected to be camping in sometimes wet environments. Also includes compression stuff sack and mesh storage bag. This bag goes for $320.00 new, but I'm looking for $250.00 including shipping to CONUS or Canada.